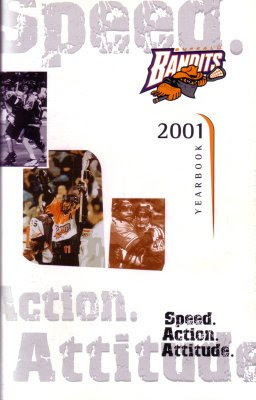 The Buffalo Bandits had the second overall pick in the draft in the summer of 2000. They picked someone with one of the greatest names in lacrosse. Ryan Powell had been a three-time All-American for Syracuse University. He and brothers and Mikey all wore #22 for Syracuse and helped maintain that dynasty. "Ryan knew then I wanted to get him," said Bandits General Manager Kurt Silcott, "because that's when I traded with Syracuse [to obtain the Smash's first pick, in March 1999]. We made that trade to hopefully be in position to draft Ryan Powell when the time came. Now we're looking pretty good." While stability was nice on the floor, it was nowhere to be found. Matt Disher stayed on the sidelines because of a dispute with Bandits management instead of reporting to training camp. Buffalo signed Phil Wetherup and Scott Komer as replacements. Both players saw action in the net, but no one was able to claim the job for very long. It was an odd season, one which saw the Bandits have all sorts of trouble gathering much momentum at time. The league saw some changes entering 2001. NLL commissioner John Livsey left the post to head up an expansion team, the Columbus Landsharks. Syracuse moved to Ottawa, and Pittsburgh packed up and headed to Washington. Buffalo opened the season on December 30, its first-ever start before the New Year. The Bandits scrambled but beat Washington, 20-19. The coach of the Power was a familiar name -- Darris Kilgour. Then Buffalo came home for an unusual five-game homestand. Whose idea was it to play five of the seven games in a row at home? The Bandits thumped Columbus, 23-10, in the home opener before 7,328. John Tavares had seven goals. That was followed by a 26-18 win over Philadelphia. Against the Wings, Derek Malawsky had four goals and 10 assists to tie a team record for points in a game. "I wasn't preparing myself to score a lot of goals or get a lot of points, it just sort of happened with the flow," said Malawsky. "I got it going halfway through the first quarter and it seemed like we had it going all night." But Toronto ended the unbeaten start with a 14-13, double-overtime decision that was a crusher. The Bandits led by two goals in the final minute, but gave up a goal in the final second. "I don't think we ever recovered from that game psychologically," Sawicki admitted later. The Bandits then beat Ottawa, but lost to Washington in spite of a club record 77 shots. "It felt sweet only because it put us in first place. My heart's always been in Buffalo," Washington coach Kilgour said. That put Buffalo at 4-2, with six of the remaining games scheduled for the road. The Bandits won in Ottawa, but lost in Philadelphia. Wins against Columbus and Albany put the team at 7-3 and right in the middle of the playoff fight. In between those wins, Buffalo tried to resolve its goaltending situation with an unusual deal. How many times are two goalies traded for each other in midseason when neither of them has a win? That was the case when the Bandits sent holdout Disher to Ottawa's Derek Collins, who was 0-10 with the Rebel. "I didn't feel like there was any pressure on me, I was just eager to get in there," Collins said about his debut against Albany. "I wanted to do my job. I had the confidence that these guys would play well in front of me and score goals. It's nice to be on a team like that." Rochester spoiled some of the Bandits' playoff dreams with a 10-9 win in HSBC Arena. If the Bandits were going to make the playoffs, they'd have to earn it. Kilgour's number, #43, was retired before that game; it was interesting that it wasn't done when Washington had been in town the previous month. "It's kind of ironic," said Bandits forward Shawn Williams, who led his team with three goals. "All year we've been scoring so much that we've been burning the lights out. Then we finally have a game where we play really good defense, and we just don't score enough." The Bandits did beat Albany on the road, and Tavares recorded his 86th point of the season in the process to break the NLL scoring record. But the Bandits then lost in Rochester to put a dent in its playoff hopes, and lost to New York, 18-13 (Roy Colsey with eight goals for the Saints), to finish 8-6 on the season. That wasn't good enough for the postseason, especially since the Bandits went 2-5 against playoff teams. Tavares had a spectacular year with 51 goals and 64 assists for 115 points (team record in all three categories). He was named the league's Most Valuable Player and was a first-team All-Pro. "I never thought he'd score that many points," Sawicki said of Tavares. "But we always seem to need him. We've had to rely on him more than I wanted." Williams (77 points) and Malawsky (70 points) weren't far behind. Powell finished with 35 points in his rookie season but had some growing pains adjusting to the indoor game. Wetherup made the all-rookie team with a 6-4 record, while Collins went 1-2 after arriving in Buffalo. The playoffs were terrific, with all three games decided by one goal. Philadelphia edged Toronto to win the championship. But Buffalo had been merely decent in 2001, a year that saw Ottawa win only one game and Columbus take three. Meanwhile, the Bandits never drew as many as 9,000 fans to a single home game. The team's glory days were starting to become a bit distant.